This extension provides email delivery for CiviMail and/or other email from CiviCRM via the Mandrill service. 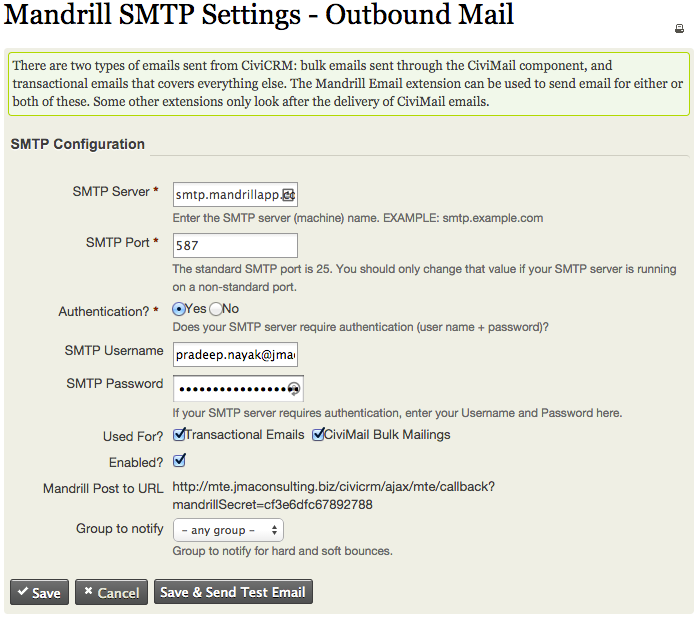 Mandrill is an email service that runs on the email infrastructure that powers MailChimp. It is a high quality, low cost option for email delivery, with no loss of delivery functionality, quality or performance in comparison with alternatives. Unlike some other email delivery integrations for CiviCRM, Mandrill Emails supports sending non-CiviMail as well as CiviMail messages through the service. So you benefit from white listing, bounce processing and click-through tracking for personalized emails like event registrations, contribution receipts, and membership renewal reminder notices. By handling bounces and spam reports from recipients for your transactional emails (everything sent that doesn't go through CiviMail), this extension preserves your domain's email reputation. Mandrill is free for low-volume use, and has a tiered pricing structure once more than 12k emails are sent per month. This Mandrill Emails extension creates an Activity for each email sent to a person, and processes responses from Mandrill arising from them using a unique tracking identifier inserted into a custom email header. Version 1.x supported only transactional emails. Version 2.x adds support for sending CiviMail emails via Mandrill. JMA Consulting developed this extension with the generous sponsorship of Power to Change for early versions and MailChimp for version 2. For support, please see the extension's github issues queue.